24 November 2012 - microbat check. 1 banded male and 7 banded females, 6 pregnant and one with two pups. Niki worked in NE woodland. 22 October 2012 - Slashed Trad in area D4. 3 hrs work. 20 October 2012 - microbat check. 1 banded male. 22 September 2012 - Bat check - 7 bats in 3 tubes. Male in T2, female in T10, and 5 females in T8. All previously captured. 25 August 2012 - Bat check No bats. 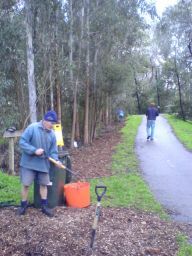 2 August 2012 - Slashed around picnic areas - 1.5 hrs work . 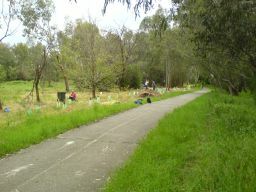 29 July 2012 - Community work day - Planted 40 Kidney weed (Dichondra repens) into, and weeded the RMIT 2011 area. David mowed the upper level. 8 people - 28hrs work. 28 July 2012 - Bat check 1 male & 1 female Gould's wattled bat in tube 10. 19 - 20 July 2012 - Put up 2 more bat tubes, these with carpet lining to provide more insulation. Slashed some of the 2009 area. 2 hours work. 13 July 2012 - Community work day -Planted 120 Poas into, and weeded the 2008 area and spread mulch (from City of Boroondara) around the newly planted Poas. Also planted about 25 native raspberries into the area. 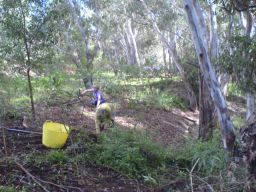 Michael and Niki planted 5 x Fairy Grass Lachnagrostis filiformis (Lower plenty), 1 x blady grass Imperata cyclindrica ( Eltham), 2 x Native Flax Linum marginale (Templestowe) and 5 x Clustered Everlasting Chrysocephalum semipapposum (Gully form) (Eltham), and a couple of Poa labs (grown by Niki Smith from seed collected from the 2008 Burke Rd Planting) in the Microlaena patch on the south side of the billabong. 11 people - 44hrs work . 5 July 2012 - Cut and painted a cotoneaster near the Golf course fence. ½ hours work. 30 June 2012 - Bat check 1 male & 1 female Gould's wattled bat in tube 5. 27 June 2012 - Mowed and slashed around the lomandras and path in RMIT 2012 area. 2 hours work. 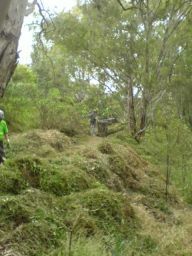 24 June 2012 - Community work day. Weeded the 2008 area and planted 200 poas. 7 = 25 hours work. 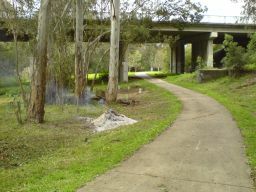 14 June 2012 - Mowed the picnic areas and beside the path from Chris Cross track to Burke Rd. bridge. 1 hours work. 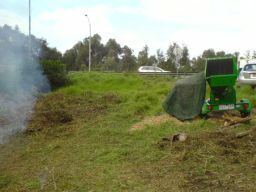 13 June 2012 - Slashed and mowed kikuyu in RMIT 2012 area. 3 hours work. 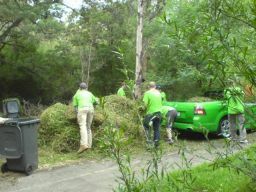 8 June 2012 - Community work day. Weeded the 2008 area. 10 = 41 hours work. 7 June 2012 - Collected more stakes from MW Brooklyn. 5 hours work. 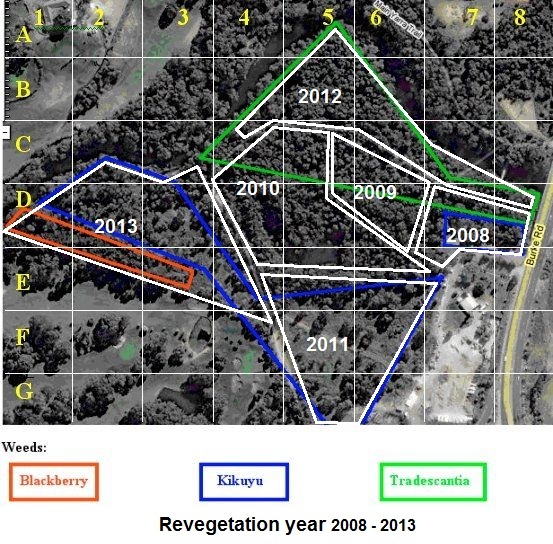 6 June 2012 - Slashed kikuyu in RMIT 2012 area and blackberry near golf course fence. 1.5 hours work. 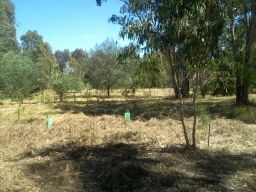 1 June 2012 - David dug out the dead clumps of chilean needle grass in the sprayed site in the woodland near MW pumping station and staked more red gum seedlings. 5 hours work. 31 May 2012 - Slashed around picnic area. 1 hours work. 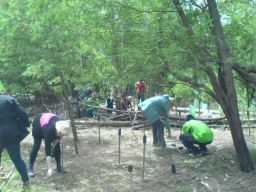 27 May 2012 - Community work day. Weeded the RMIT 2011 area. David mowed over top of boxthorn debris near car park. Planted more Poa labs in the chilean needle grass area near MW. 7 = 34.75 hours work. 23 May 2012 - Slashed Trad in first section of the RMIT 2012 area. 1.5 hours work. 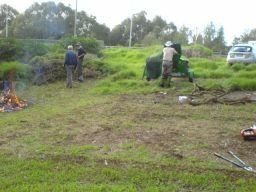 15 - 17 May 2012 - Slashed RMIT 2011 area, Mowed picnic area and top area where box thorn piles were. 4 hours work. 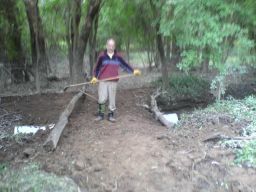 11 May 2012 - Community work day. Hired a chipper and chipped the boxthorn from the upper level. 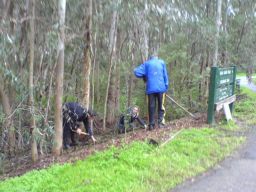 Weeded the RMIT 2011 area and planted Poa labs in the chilean needle grass area near MW, goodenias on the boxthorn slope, and Native Elderberry (Sambucus gaudichaudiana) in the 2008 area. 7 = 42.5 hours work. 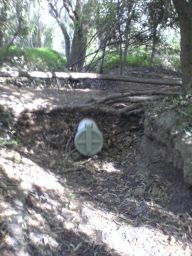 29 April 2012 - Community work day. Weeded and spread 2 ute loads of mulch (kindly donated by City of Boroondara) on the eastern bank of the 2008 area and planted 6 Poa labs, 5 Kangaroo apples and 10 Fishweed goosefoot (Einadia trigonis). 4 * 3 hours work. 19 April 2012 - Weeded in the 2008 area. 2 hours work. 16 April 2012 - Weeded in the 2008 area. 2 hours work. 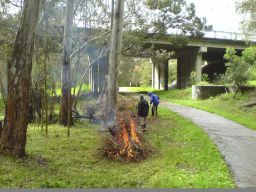 13 April 2012 - Community work day. Weeded in the 2008 area and planted 30 sprawling bluebell (Wahlenbergia gracilis) and 25 Fishweed goosefoot (Einadia trigonis). 5 * 4 hours work. 12 April 2012 - Slashed lots of nightshade and a few other weeds in the northwest of the woodland and around the lomandra in the 2013 area. Saw the kangaroo again. 1½ hours work. 5 April 2012 - Slashed picnic area and around edge of car park level. 1 hours work. 3 April 2012 - Slashed part of the 2008 area and a path to/through the eastern section of the woodland. Slashed some of the taller weeds in the woodland. 1.5 hours work. 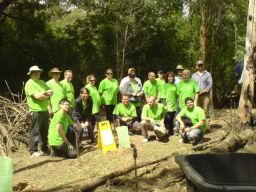 25 March 2012 - Community work day. Weeded and slashed the 2008 area and sprayed blackberries in the 2013 area. 3 * 4 hours work. 22 March 2012 - Slashed beside the shared path west of the culvert and boxthorn slope. Pulled kapok vine off golf course fence. 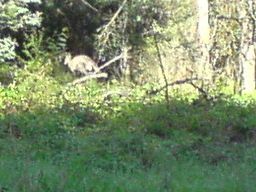 Saw the kangaroo in the north-west area. 3 hours work. 14 March 2012 - Slashed beside the shared path east of the culvert. 1.5 hours work. 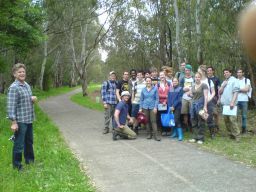 RMIT students visited the reserve as part of their restoration unit. 21 January 2012 - Bat check - 8 Gould's wattled bats and 4 escapees. 4 of these bats were banded in September.